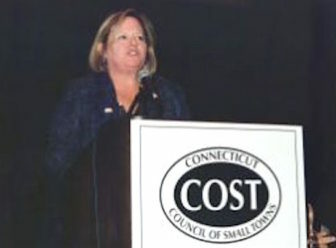 The Connecticut Conference of Municipalities continues to press for reform of the cap, which critics say encourages some poor fiscal habits, such as borrowing for ongoing expenses. And the Connecticut Council of Small Towns continues to urge legislators to repeal the cap altogether. And with the state facing a $1.3 billion projected hole in its next budget — with signs that it could get significantly worse — communities also are concerned that the revenue sharing could end, but the cap might remain. “Who does the state of Connecticut think it is, with its dysfunctional budget process, telling the towns how to budget?” said Lyme First Selectman Ralph Eno, whose community recently refused to accept $21,000 in state sales tax receipts. Hailed by the legislature’s Democratic majority as a “historic and transformative” accomplishment in 2015, the revenue-sharing plan and cap have been controversial since their enactment for several reasons. Despite worsening deficit projections driven by surging debt costs stretching out to the end of the decade, lawmakers promised to share an increasing amount of sales tax receipts with towns — without increasing the base rate of 6.35 percent. Communities were supposed to get almost $246 million this fiscal year, nearly $300 million by 2017-18, and top out at about $350 million by 2018-19 and each year thereafter. That last number represented the revenue from one-half of 1 percentage point on the sales tax. The funds would fall into three categories. Two of them would directly benefit municipal governments. There would be an expansion of the state grant program that provides relief to communities with large amounts of property exempt from municipal taxation. Cities and towns would receive a second chunk of funds distributed as general aid. The third form of assistance would be aimed directly at households, not town halls. Property taxes on motor vehicles would be capped in an estimated 50 to 60 communities with the highest property tax rates by using state sales tax receipts to offset the loss in affected cities and towns. In exchange for this bounty, the state would cap municipal budget growth at 2.5 percent. Communities that exceed this threshold would have their revenue-sharing dollars reduced. There were 12 months between the plan’s enactment in June 2015 and July 2016 — the start of the first fiscal year of major revenue-sharing. In the meantime, local leaders raised a host of concerns. What if a community is growing and developing? For example, having more properties on the grand list subject to local taxation is beneficial, but it also places more demand on local services and may require more government spending. Lawmakers, who didn’t anticipate that objection initially, created an exemption in the capping system to accommodate local growth. But while the municipal cap also exempts debt service payments and worker salary and benefit costs mandated by arbitration awards, municipal advocates countered this isn’t necessarily a good thing. Both DeLong and COST Executive Director Betsy Gara said the former could encourage communities to borrow for operating expenses, incurring unnecessary interest costs just to stay under the cap. And would the exemption for arbitration awards discourage towns and employee unions from reaching agreements on contract awards, since those deals not mandated by an arbitrator would be subject to the cap? “We think that arbitration is going to go through the roof,” DeLong said. Gara said other problems remain, including an insufficient exemption for equipment and other capital costs and a murky system for determining special education expenses. And underlying all of these questions were two larger ones? Will state government renege on the promised revenue-sharing as its budget deficits grow, and, if so, would some type of capping system remain? 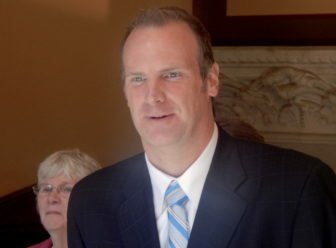 Looney, whose caucus first proposed the revenue-sharing plan in 2015, said legislators remain willing to work with municipalities to adjust the program, but added he fears it is “actually misunderstood, or deliberately misunderstood” by municipal officials who chafe at the concept of a cap. The system only penalizes communities that overspend in terms of their share of sales tax receipts. It doesn’t reduce other municipal grants. Gara, whose organization is seeking the cap’s repeal — and not its modification — notes that the revenue-sharing program already has been reduced. Cities and towns were supposed to share $246 million this fiscal year. But as legislators and Gov. Dannel P. Malloy struggled to close a $1 billion hole in state finances without raising taxes, they reduced the revenue-sharing to $185 million. To help pay for the revenue-sharing, they cut other municipal grants by about $100 million from the original 2016-17 budget. The highest profile component of the plan, the car-tax freeze, was scaled back significantly this May when lawmakers closed the state budget deficit. Plans to cap municipal taxes on vehicles at 32 mills were modified to 37 mills. According to CCM, only 17 of Connecticut’s 169 cities and towns currently tax vehicles at a higher rate than 37 mills. The modification squeezed several blue-collar communities out of the program, including Bristol, Meriden and Windham. Further complicating matters, the legislature’s nonpartisan Office of Fiscal Analysis projects an even larger deficit, about $1.3 billion, built into the state budget that begins next July. And that forecast, which was issued in May, doesn’t take into account downward trends in state income and other tax receipts identified since then. As legislators from both parties campaign for re-election this year, stressing their opposition to further state tax hikes, local leaders wonder if they can balance Connecticut’s books next year and maintain the revenue-sharing — even at its current, reduced level. Eno, a Republican, said his community, which only was in line to receive $21,000 in sales tax funds, declined the aid to protest a capping system that binds the choices of local voters. But there has been Democratic criticism of the municipal spending cap as well. 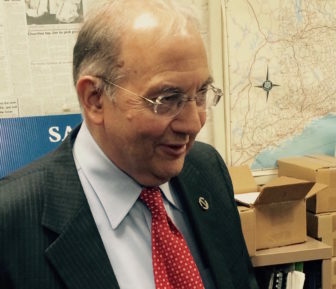 “Get rid of that (sales tax) money, get rid of the cap, and just leave us alone,” said Ridgefield First Selectman Rudy Marconi, a 2010 Democratic gubernatorial contender, said during a CCM press conference to protest the system last March. But DeLong and Gara both said they don’t believe municipalities and the state are destined to play adversarial roles in this matter. Gara said small towns could enjoy significant relief if legislators are willing to ease prevailing wage laws that often mandate union-level wages on public construction projects. “The moral of that story is the legislature usually shows a willingness to come back and address these things, DeLong said, adding that officials at both levels of government want to “drill down to economic issues and find out what we can do to put Connecticut on sound economic ground.